The time for ghosts, ghouls, and goblins is just around the corner! Halloween can be a scary time of year, but not just for the witches and werewolves. It can also be dangerous for pedestrians and drivers. Children are often out running around in costumes that may be difficult to see in the dark. They often think the rules about looking both ways before they cross the street do not apply when they are in costume. The incidents of drunk driving also increase around this time of year because of the many holiday-themed parties and gatherings. With all of the increased hazards, you may wonder how you can keep you and your family safe this Halloween. Brightly colored costumes are not only fun for children and adults, they can also help keep you and your family safe. Having a brightly colored costume will increase your visibility while you are walking around at night, whether it is walking your kids trick-or-treating or attending a Halloween-themed house party. Pumpkin carving is a great Halloween past time that is fun for all ages. Children, however, may not be the best candidates for pumpkin carving. They often just do not have the coordination and dexterity to handle a sharp knife. Try using a kid-safe kit or paint your pumpkins instead of carving them. If you are staying home and handing out candy, you want to be sure that your property is safe for visitors. Even if you have props in the yard, they should not be placed in a location where a child could trip over them. Your yard should also be well lit for the safety of the trick-or-treaters and you! If you can, you may want to simply avoid driving on Halloween. If you cannot, be on the lookout for pedestrians and children. Rules sometimes get thrown out the window on Halloween, and it isn’t just the children who are not paying attention to vehicles. Be extra cautious and always use your headlights. 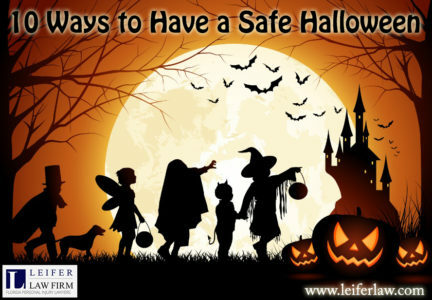 Unfortunately, children sometimes receive candy or other trinkets that are not safe. Do not let your children eat any homemade goods or unwrapped candies. If it looks questionable, err on the side of caution and throw it out. Do not let your child snack on candy while they trick-or-treat; this will not allow you to take a close look at the candy before they eat it. Costumes are a lot of fun, but they can be harmful if they are used improperly. Even something simple like a hard plastic sword can cause damage if a child takes their playtime a bit too far. Minimize costume accessories, if possible. Otherwise, stick with smaller, soft accessories that are unlikely to cause damage. You should also be sure that your child’s costume fits properly to avoid problems with not being able to see or move. Costumes can be extremely flammable, and many people do not realize what kind of effect that can have until after it is too late. Avoid walking too closely to lanterns, fire pits, or torches. Be sure that if you are using flames at your home, they are protected from passer byres and children. Halloween usually comes with parties and other festivities that involve alcohol. It is important that you refrain from drinking and driving. Call a cab or designate a driver. Driving drunk on Halloween could not only affect you, you could hit a child and end his or her life. Be safe and smart! Pets are great to walk around with children or greet trick-or-treaters at the door. However, you need to keep a close eye on your pets so they do not lash out on guests or run off. Not everyone will like your dog or cat, and you need to be able to control your animal when guests or other trick-or-treaters are uncomfortable. Halloween is well-known as a night of mayhem. This not only applies to children in costumes, adults and teens looking to cause trouble can be a serious problem. Encourage children to stay in groups, and even adults may want to use the buddy system!